I was actually heading over to the stall for the Swiss chard when I saw the most beautiful purple kale a little further down on the table at the Green City Market this Saturday. I did not let the "Organic Cilantro" tie around the stems fool me (I know my cilantro, even if I don't always know my kale). I bought a bunch of it so I could have a frittata for breakfast. I've been using fresh herbs all summer, but I had a hankering for tarragon so I used dried tarragon. The cheese is Grass Point Farms Sharp Cheddar. 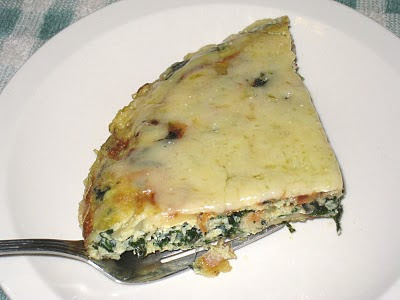 As always, the frittata was delicious. I love the versatility of it - you really can just throw in whatever is around and have a truly delicious, satisfying breakfast. And since they are good both warm and cold, they travel well. The recipe for the basic frittata can be found here. For a tutorial on how to make one, go here.